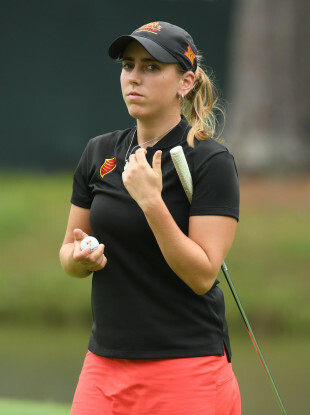 POLICE HAVE CHARGED a man with the premeditated murder of a Spanish golfer, Celia Barquin Arozamena, who investigators say was assaulted and killed on a golf course in the US state of Iowa. The 22-year-old’s body was discovered yesterday by police officers who responded to a report of a “suspicious” unattended golf bag at the Coldwater Golf Links in Ames, Iowa. They found her body nearby and determined she “had been assaulted and died as a result,” according to a police statement. Colin Daniel Richards, 22, was identified as a suspect and charged with first-degree murder. “Celia had an infectious smile, a bubbly personality and anyone fortunate enough to know her was blessed,” Jamie Pollard, the Iowa State Director of Athletics, said in a statement. Our Cyclone family mourns the tragic loss of Celia, a spectacular student-athlete and ISU ambassador. In August she had advanced to Stage II of the LPGA Tour qualifying tournament. Email “Man charged with murder after Spanish champion golfer found dead at US course ”. Feedback on “Man charged with murder after Spanish champion golfer found dead at US course ”.